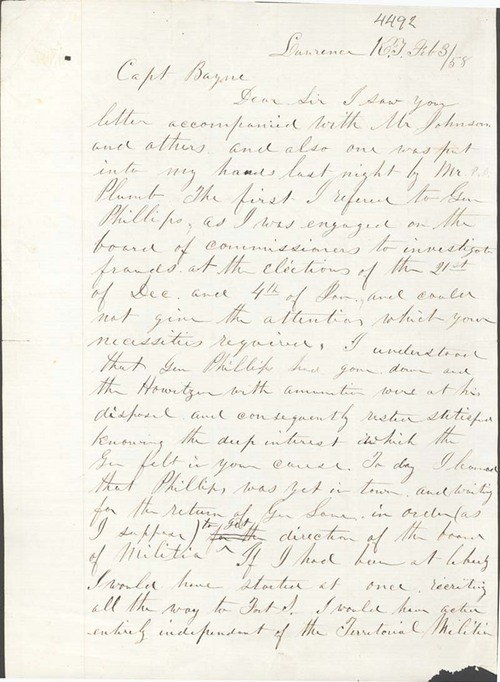 James Abbott wrote from Lawrence, Kansas Territory, to Captain O. P. Bayne, to explain his delay in responding to Bayne's request for military aid. Abbott wrote that his engagement with the committee investigating election fraud in the December 21 and January 4 elections had caused him to pass the request to General Phillips (possiblity William A. Phillips). Phillips, instead of responding directly, waited for Major General James Lane to return to town and approve the action. Abbott was apologetic, and stated "if I had been at liberty I would have started at once. . .entirely independent of the Territorial Militia."